Hello everyone!!! 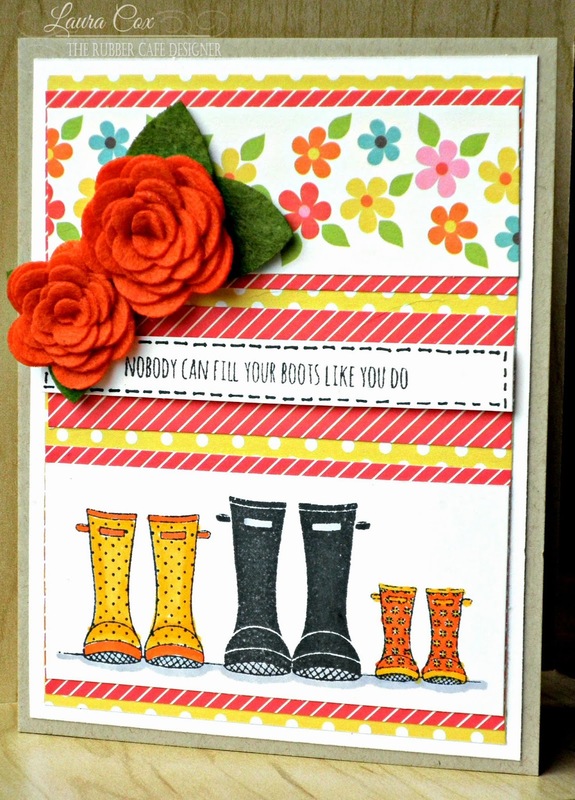 I'm sharing another card today made with the Spring Is Here kit from The Rubber Cafe'. Today I'm using the add-on stamp set available--Wishing You Well--and yes, I am totally crushing on this sweet little boot stamp!! First Layer: 5" by 3&3/4" piece of yellow dot pattern paper matted on a 5&1/4" by 4" piece of white cardstock, then glued to the base using Scrap Happy Glue. Next layer: Cut three strips from red diagonal stripe paper--all 3&3/4" long, one 1&1/2" (TOP strip), one 1" (CENTER strip), and one 2" wide (BOTTOM strip). Glue these to the yellow dot paper, and remember to start in the center and work your way out for the best results. You'll have about 1/4" of yellow dot paper peeking out between each strip of red diagonal paper. On the top strip add a 3&3/4" by 1&1/4" piece of flower pattern paper. Center strip--on a 3&3/4" long piece of white cardstock, stamp sentiment in Black Tuxedo Ink, trim very close (it's about 1/4" wide), then faux stitch around the edges. Foam tape to center strip on card. Bottom strip--stamp boots in Black Tuxedo Ink on white cardstock, color with markers, trim to 3&3/4" by 1&3/4", glue to card. A tip here for coloring in--I used a gray marker under the bottom of the boots....this grounds the image, and also adds some depth to the image. To finish, I put together 2 of the flowers--flattened them a bit with my hand, then added leaves. Tip 1: I cut the leaves apart on the larger flower for more flexibility in my arrangement on the card. Tip 2: use your Scrap Happy Glue to make a larger firmer "glue dot" of your own that is custom for the size you need to easily create your flower. I wanted about a quarter size and then one a little bigger than a dime for the smaller flower. I used a scrap of sticker sheet (I save my used sticker sheets from other projects) and filled in a circle of Scrap Happy Glue with a thin layer of more glue and let it dry overnight (doesn't take quite this long, but I don't have to watch it closely or worry about thick spots of glue if I do this). I then just formed my flower in my hand, then stuck it right on the jumbo dot of dried glue. Now the flower is ready, and also ready to stick right to my project! Thanks so much for stoppin' by the cafe' today! Stop back soon for more inspiration!